It seems like just yesterday that we saw the release of Sabayon 9 with its three desktop flavors, but already the project team behind the popular Linux distribution has launched a new version. Sabayon 10 made its official debut late last week, and certainly most notable among the new additions to the free and open source operating system is yet another desktop edition, bringing the total number of choices for users up to four. 10 brings a number of other enhancements to the table as well. Here's a quick overview of some of the highlights. 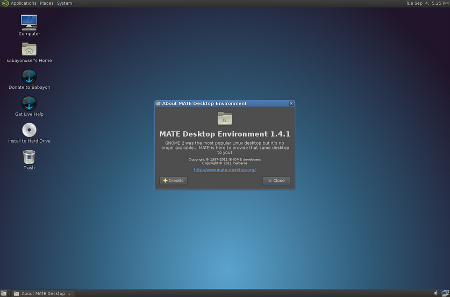 Linux fans are no doubt already familiar with MATE, the GNOME 2-like desktop that was first included in Linux Mint 12 as an alternative for users wary of GNOME 3, and there's no doubt it's been gaining steam. MATE is already available in packages for Debian, Ubuntu, and Fedora, just to name a few, and now it's part of Sabayon 10 as well. As with Sabayon 9, this latest version comes with three other desktop editions as well. Specifically, version 10 can be had in editions featuring KDE 4.9, GNOME 3.4.2, or Xfce 4.10. Also new in Sabayon 10 is the ability to run the operating system on Amazon's EC2. Amazon Machine Images (AMIs) are now available for users interested in trying out Sabayon on Amazon's cloud platform. Based on version 3.5.4 of the Linux kernel, Sabayon 10 updates numerous other packages as well, including bringing LibreOffice to version 3.6. Among many smaller updates and fixes, meanwhile, “one nice and small feature worth a mention is the ability to sanity check your Live media (whether it is USB or DVD doesn't matter) through the Live boot menu,” the project team notes. Last but not least, one of the key features added in Sabayon 9 was a hardened Gentoo profile, and Sabayon 10 takes that even further by also providing an X.org-friendly hardened kernel based on the Gentoo hardened patch set. Want to give Sabayon Linux 10 a try for yourself? It's available as a free download from the project site.